I’m not sure I’ve seen an image that captured billowing steam like this before, but the ghosting along the image partially obscuring the men in the background is probably steam from the cook stove at left. 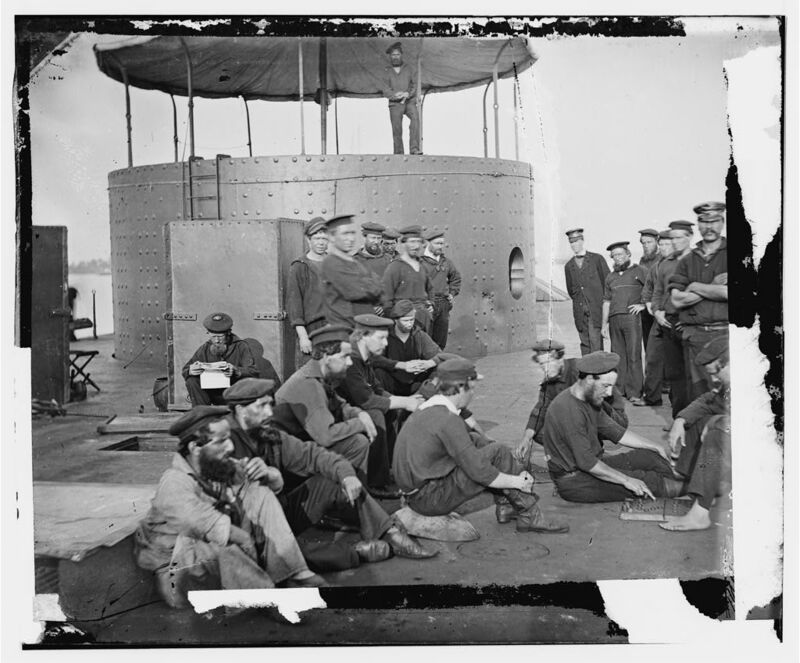 These images were taken of the USS Monitor on station in the James River in 1862 after she was sent to respond to the CS Merrimack’s incursion into Hampton Roads to attack the Union blockading fleet on March 8 and 9, 1862. As a keen eyed reader pointed out, you can clearly see a dent in the turret in the second image. The Monitor would sail up the James after the Merrimack was scuttled on May 11th, 1862 when the Confederates abandoned Norfolk (the Merrimack’s base) and it was too deep of draft to make it up the James River so it was destroyed. These two images would have been taken some time between the loss of Norfolk and the destruction of the Merrimack and the Monitor’s participating in the bombardment of the Confederate Batteries on Drewry’s Bluff on the James River in support of General George B. McClellan’s Peninsular Campaign on May 16th, 1862. The above image is strikingly clear and show some great detail of federal sailor uniforms. The man in the foreground is the cook in the top image and the man in the turret top of both images is the same. There is also a uniformity of dress absent from most images of infantry and cavalry units in the civil war. The navy was federal whereas the overwhelming majority of infantry, cavalry, and artillery units used in the land war were state volunteers. The navy on the other hand was all federal. One did not volunteer for a state navy (the states did not maintain a navy)but enlisted in the Navy whose adherence to dress and code was much more strict than that of the volunteer ranks. Of the regular infantry regiments that saw service one would have seen similar discipline and uniformity of dress as her officers were all West Point graduates and not appointed or elected. Same for the Navy, whose officers would all have come from Annapolis and seen service before the war. By contrast with the other armed services, the uniform is simple and looks to be comfortable. In the iron clads, the new entry into naval warfare, the mode of dress needed to be light as the steam powered engines produced an internal heat that was at times unbearable. Lightweight wool frocks and trousers and light shoes being standard enlisted uniform. The standard Frock for northern climes was, as pictured above, the woolen variety. There were also Frock’s of Canvass and of Muslin depending on the area of duty and need for personal comfort in heat and tropical areas. By contrast with the army, the navy (with a previously established lax attitude towards questions of white and black co-service or integrated crews) had allowed blacks to serve in enlisted capacities before the war. In the below excerpt from Sec. of the Navy Wells, a more formalized process to enlist blacks more wholeheartedly was acted upon. There are several postulates for this incongruity of racial preference between the Army and the Navy. Enlisted men’s duties on a ship could be varied and for the vast majority of sailors in the war time was spent on blockade duty, anchored off of the coastline and river outlets doing little but keeping their ship afloat and on occasion pursuing anything headed in or out. These would be moments of punctuation in a seemingly endless procession of days. 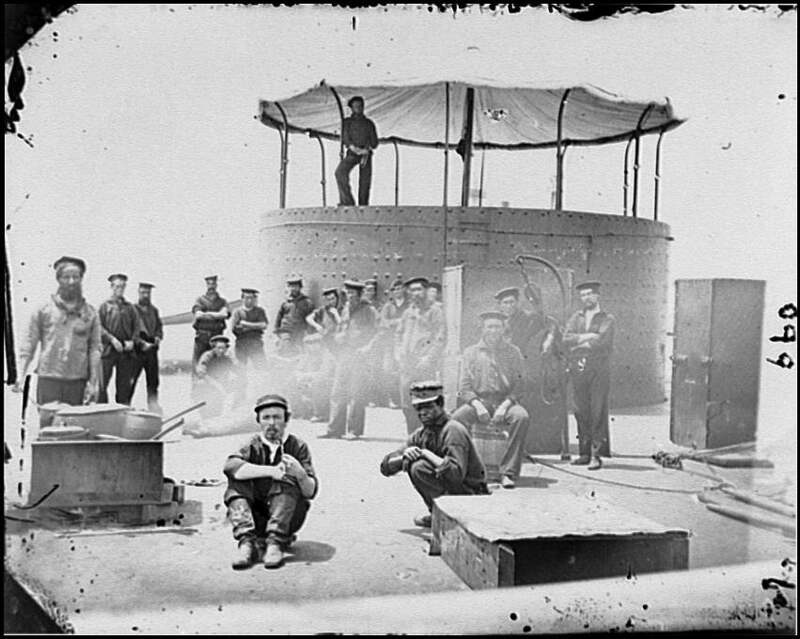 Crews of a boat have their specialties and for the enlisted men one job was just as onerous as another. Manning a cannon or trimming a sail are jobs to be done and the navy did not have any qualms using black men as to white men for any duty save for that of officer rank. It should also be noted that the Marines of this time were strictly white, so a disparity of what one expected of the races (like in the Army) in the war fighting duty they performed seems to be the overall guiding principal. By war’s end, the Navy would have some 15% of its enlisted sailors being free blacks from the north and southern born free and former slaves. There was no attempt to have segregated crews and even when the Army was still grouping black volunteers and enlistees in its ranks through World War II, Navy crews were still integrated. I believe this speaks more to the early mindset that the former and current slave populations were not cultured for organized combat nor trustworthy enough to be given weapons. The typical seaman would rarely touch a weapon but for a cutlass or a cannon and only when needed. The Marine’s, however, were always under arms and were expected to fight as infantry while on land and as defenders on the ships assigned to while at sea. The naval tradition spoke more for the ability to integrate the races even in combat situations than was previously given proper merit. Whites and blacks could work together aboard ship without issue as all ranks are equally the same. A very good article, with interesting trivia about Naval policies and equipment of the period. One small point I’d like to make is that these photographs were made AFTER the Monitor’s engagement with the C.S.S. Virginia (Merrimack). The second image clearly shows the dents received in the turret during this historic encounter. One shot, delivered at close range, left a perfect impression in the Monitor’s armor plating. Having little to shoot at, Confederate gunners aboard the Virginia attempted to target the gun ports in the turret with hopes of disabling the cannon and killing its crew. Later gunboats of this design were fitted with shutters that closed when the piece was being reloaded. You sir, are correct. I should have looked that up before assuming but after your comment I remembered seeing the dent and the thought did pass through my mind that perhaps I was misstating the time frame. The Monitor wouldn’t have been in the James River had it not been for the encounter with the Merrimack in the first place; good catch! After the Merrimack was scuttled in the James after Norfolk was threatened. Next Next post: What’s in a title? Send me a Free eBook! New Release and New Series Launch!